I can’t remember anyone moaning about the cold weather – or the cost of petrol – or rising fuel bills. No-one ever discusses what the government is doing or not doing to solve the country’s debt problems. They never have to wait days to see a doctor, or complain about the state of the NHS. No-one in Eastenders ever seems to have to cope with cuts to their benefits, and even those who are supposed to be struggling still seem to be able to eat regularly in the café and drink in the Queen Vic! And those who have money never complain about falling interest rates or problems with their pension fund. People in Walford never talk about the financial situation, either here or in the Eurozone, at all. Let’s face it, in the world of Eastenders there doesn’t appear to have been a banking crisis at all. In fact, Eastenders exists in a strange kind of world where, when you ask for a loan as Ian Beale did recently, bank managers come out and meet you in the local café to discuss your needs. How come it’s actually so much better for the residents of Walford than the rest of us? The reason, of course, why they are all so protected from the reality of life is that they never see news reports – with the notable exception of the Olympics last year – of anything important happening in the real world. They never watch the TV news or listen to the news on the radio. I can’t remember the last time I saw someone actually open a newspaper other than the Walford Gazette. There just is never any official news report anywhere in Walford of any of those important events that affect us all. So they never hear or read the bad news reports that we in the real world have to face daily. Mind you, they never get any good news either. In that respect they’re no different from the rest of us. When do we ever see any good news reported, either as the main news item on the TV, or on the front page of a newspaper. It has long been the attitude of reporters that good news is not news at all – it’s the bad news we need to be told about. Well – today is, of course, about good news. And good news that can make a difference to how we deal with the bad news we face day by day. Actually, this is the most important news – good or bad – in the whole of human history. And yet there is no official report of the event we celebrate today. It wasn’t front page news. No-one was there to see it. It happened in secret, in the darkness of a stone tomb. The Gospel writers do not attempt to describe it. How could they? They simply record that it had happened and describe what happened afterwards. And even the earliest gospel, that of Mark, wasn’t written until at least 30 years after the event. We have no eye-witness account of the most important news ever because no-one was there to see it. 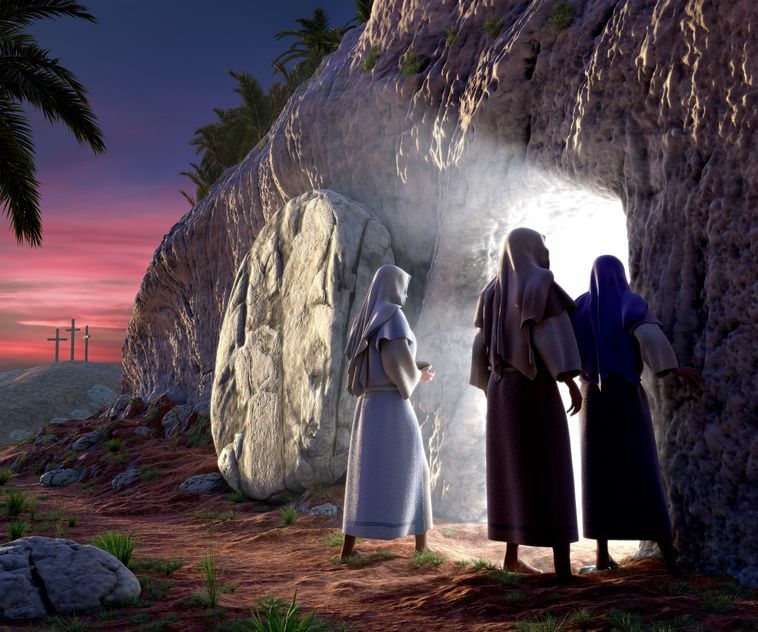 By the time anyone arrived at the tomb it was already over – the resurrection of Jesus had been accomplished. Instead, the different Gospels tell us different stories about the people who after the event found out that it had happened, hinting at what they experienced and what effect it had on their lives. Take Mary Magdalene. Despite their differences, all the Gospels agree that she was the first to see the risen Jesus. We are told that she was someone Jesus had healed, and who had become his follower as a result. Imagine the emotions she must have felt that first Easter. Delight as Jesus was welcomed by the palm-waving crowds, turning to anxiety as the threats to his safety increased, despair as he was arrested and tried, torment as she watched him die, hopelessness as she helped to bury him, grief as she returned to anoint his body. And then the amazement as she met him alive again. Jesus gave Mary a new start, twice — once when he healed her, and again when he made her the first messenger of his resurrection. Then there was Peter. One of Jesus’ closest friends, who had let him down badly in his hour of need. Faced with the danger of arrest, Peter had been unable to cope with his fear. So he had denied knowing Jesus — as Jesus had predicted that he would. When Jesus died, his world must have fallen apart, because now he would never have the chance to say he was sorry. The resurrection gave him that chance, and with it a message of reconciliation for all people. No wrong that we can do, no denial or harsh words, no injury or insult, is beyond the reach of God’s love. A love that can conquer death can deal with any wrong that human beings can do, can neutralise and forgive it. And Thomas, for ever known as doubting. He refused to believe that Jesus was alive again — and who can blame him? It’s such an unlikely story. But Thomas has come to stand for all who find faith difficult, who have doubts about the story of salvation. Thomas insisted on seeing and touching Jesus before he would believe. When Jesus granted his wish, he did not berate or punish him for his doubting, but accepted Thomas as he was and then helped him move on. What is there for us in these stories, as we gather today to experience anew the resurrection of Jesus? Perhaps some of us, like Mary, are in need of a new start. Perhaps we have become weighed down by problems, by bereavement, by illness, by financial worries, and we feel there is no escape. For us, then, today offers new hope. The resurrection of Jesus shows us that God’s love is stronger than any power of despair. Or perhaps, like Peter, we bear the guilt of hurtful things said, or perhaps things unsaid, things done wrong that we can never put right. The message of the resurrection is one of forgiveness. There is no condemnation in the eyes of the risen Jesus as he looks at Peter, and at us, only love. And perhaps we have doubts about this very unlikely and strange story we hear again today. Like Thomas, we may have moments when we long for some hard evidence. Thomas’ story affirms that we are allowed that longing. We are allowed to doubt, and our doubts do not cut us off from the power of Jesus’ resurrection. Whatever the state of our faith in God, God has faith in us. Mary, Peter, Thomas, and the others – they all found that whatever bad news they had struggled with in life, the good news of a risen Lord Jesus was able to overcome it. As each of them is confronted by their crucified, yet risen Lord, they discover that the love of the God who can overcome anything – even death – can also overcome their anxieties and fears and doubts. To all who are in despair, to all who are caught by guilt, to all who doubt, here and in all the world, the message of the resurrection is this: God’s love is stronger. However bad the news may be that we have to face every day, the good news is far more powerful. For if even death cannot defeat God, then anything is possible. There is always hope, there is always forgiveness, there is always a future.